Watch this brilliant video made to celebrate the work of the greenstaff and volunteers who worked to make the Ryder Cup such an incredible success. It was filmed and produced by James Bledge, Assistant Links Superintendent of the Royal Cinque Ports Golf Club in Kent, who worked on the Gleneagles course preparation and over the duration of the momentous event in late September. 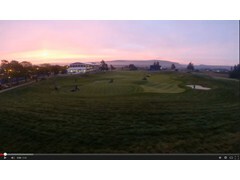 The video provides a fascinating insight into the immense efforts that all the support team put in behind the scenes, alongside the existing Gleneagles greenkeepers. And if you watch carefully, you will even see James' own Ryder Cup 'In the hole' moment. It's certainly a valuable lesson for all golfers to know what goes on in the preparation of a course. If you have produced videos of your greenkeeping experiences that you would be willing to share with other greenkeepers, please send an email from this link. James Bledge will be giving a presentation of his experiences with the Ryder Cup at Gleneagles on Tuesday 13th January, as one of a series of afternoon seminars for turf students and managers at Hadlow College in Kent. James will also address what he sees as the benefits to be gained from volunteering for completion preparations and working alongside other greenkeepers. Click here for more information from the Greenkeepers Training Committee website.